When Sam was young, he used the long walk to and from the nearest library to teach himself to play three-part counterpoint on the harmonica; as he needed both hands to carry his books, he learned to hold the harp in his mouth and play complex pieces with his cheeks and tongue alone. At any given time Sam knows about 1,000 songs - and the names of about 1,000 fish! Sam's brother-in-law, Warren McCollum, played the naive (but ultimately corrupted) young Jimmy in Reefer Madness. Sam's La Jolla home was design by the renowned architecht Albert Frey. If you have something related to Sam Hinton that you'd like to contribute to this site, please e-mail me. This site designed, constructed, and maintained by Golden Apple Design. Born in Tulsa, Oklahoma on March 31 1917, Sam Hinton's childhood ambition was to learn every song he heard. He now has over a thousand in his repertoire. "Mama used to love to tell people how she took me to Jenkins Music Store in Tulsa when I was five years old and bought me a harmonica," Sam Hinton, now 85 years old remembers. "And she said I was playing Turkey in the Straw before we got out of the store. That was my favorite instrument. Then, for my eighth birthday my grandfather got me a push-button diatonic accordion." Sam's great-grandfather, Isham Bailey Hardy (1824-1905) was a successful magician, puppeteer and ventriloquist who had his own dog and pony show. Although he died a decade before Sam's birth, many of the songs in Sam's repertoire came to him from his great-grandfather, Isham, through Sam's mother, Nell Duffie Hinton (1889-1978). She was a gifted musician who played both ragtime and classical piano, and taught piano and elocution. Very early in childhood Sam displayed a natural predisposition towards natural history. His interest in animals (especially snakes) has continued throughout his life. "I was going to be an African Explorer, and bring home animals and things," Sam recalls, "I was kind of a hard kid to raise. Mama tried to divert me, sometimes. I wanted to catch snakes and she thought it would be nicer to raise gladiolas. I've always said my early life was divided into three periods: when Mom would let me take little snakes home, when Mom would let me take big snakes, and finally, when she gave sort of tacit permission to bring poisonous snakes home, that didn't happen until we were in Crockett. She always laughed and said I was a throwback to her grandpa, Isham Hardy!" When he was twelve Sam's family moved to Crockett, a small East Texas town. This area was rich in wildlife; the study of which, along with folk music, has been the dominant force in Sam's life. East Texas is also rich in cultural diversity, and he grew up hearing music in the traditions of African America, the White South, the Cajun French, the American West, and the Anglo-Celtic mountain tradition of settler's from the Ozarks. 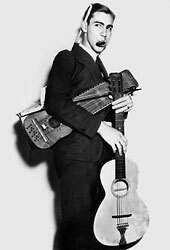 In 1934 he got his first guitar. Sam lightly fingerpicks the guitar in a syncopated style, with his fingertips, while achieving a backbeat strum with the back of his middle fingernail. According to Sam, "My mother loved to play ragtime, one of my favorite pieces was Scott Joplin's "Maple Leaf Rag." That gave me the feeling, I think, for syncopation, but I didn't know that at the time. I think what I sensed in ragtime was that the left hand was doing a pretty steady beat, and the right hand was playing a lot of offbeat things. And I think that carried over into my voice as one part and the guitar as another, doing some offbeat things with one or the other." In 1935 Sam and his two teenage sisters, Ann and Nell, began performing in local bars as "The Texas Trio." Their father championed their efforts and doubled as their chauffeur and promoter. He succeeded in securing a number of local radio appearances for his children. In early 1937 he drove them to New York City to audition for the popular radio program Major Bowes Original Amateur Hour. Later that week they appeared on the program, and during the broadcast (on the air, in fact) Major Bowes hired Sam to join the Transcontinental Revue, one of the Major Bowes vaudeville units. 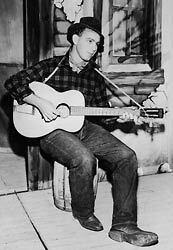 The next morning 19-year old "Texas Sam Hinton, Folksinger and Novelty Instrumentalist" caught a train for Chicago, and began a two-year tour, which took him through all but two of the continental United States. Within 45 days Sam had given over 150 performances. While Sam was on the road, the Department of the Interior relocated Sam's father to Los Angeles, California, and the family moved to nearby Glendale. When the Major Bowes tour brought him to Los Angeles, Sam enrolled in the University of California, Los Angeles (UCLA). 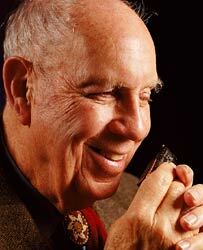 Sam remembers, "I had never given up the idea of becoming a naturalist, and doing something with animals and nature." In December of 1937, while studying zoology at UCLA, Sam met Leslie Forster, an artist, ceramicist, weaver and classically trained professional musician (specializing in viola). She is also a talented gardener and cook. Her family came to California from Canada before she was born and her father owned a music store in Oxnard, California. Sam and Leslie were married in 1940. They resided for 56 years in La Jolla, California. They had two children and two granddaughters. Leslie passed away in 2005. Their daughter Leanne is Professor of Linguistics at the University of California, Berkeley, specializing in Native American languages, and a respected composer of contemporary folk songs. Their son Matt is an artist, writer and professional announcer of equestrian events. 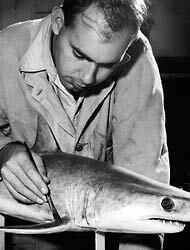 Sam graduated from UCLA with a degree in zoology in 1941. He worked as an actor, singer and musician in Los Angeles, California, and appeared in the long-running musical revue, Meet the People (1939-1940). For three years he was Director of the Palm Springs Desert Museum, and in 1944 he was hired as an Editor/Illustrator for the University of California Division of War Research in San Diego, California. Throughout his career as a naturalist he has simultaneously worked as a part-time teacher of college-level courses in music, folklore, art, science and geography, as a calligrapher and artist; and as a performer of folksongs for audiences of both children and adults. As an educator he regularly taught University of California courses for more than 35 years, and spent 16 years as Director of Relations with Schools for the University of California, San Diego. In 1980 he retired from his job at the University and devoted himself to performing full-time. Since then he has worked as many as 120 days a year giving his program "Old Songs for Young Folks" at school assemblies, and his classroom program Singing through History. In 1997 he gave 90 concerts, about 65 of them in the schools in San Diego County. Over the past six decades he has performed for millions of schoolchildren. Sam served on the Board of Directors of Sing Out! Magazine, and has written numerous articles for various science and folklore journals. In his 65-year professional career as a performer he has given thousands of concerts all over the US, in Canada, Mexico and Europe. He has had his own radio and television programs, and has appeared at most of the major folk festivals. Sam has recorded a dozen solo albums (some 200 songs). His first commercial recording Old Man Atom (1950) has been reissued as part of the folk music collection Folk Song America [out of print] by the Smithsonian Institution. His early recordings (1950-1957, for Decca, ABC, and Bowmar) are out of print, but four of them, originally recorded for Folkways (1961-1967) are still available from Smithsonian Folkways Records (two are of children's songs). Psychologist Fitzhugh Dodson wrote about Sam's Folkways album Whoever Shall Have Some Good Peanuts in his book How To Parent. He said "Folkways has put out the record I would buy if I were allowed to get only one record for my own children." This site ©2002 by Golden Apple Design. All rights reserved. No portion of this site or its contents may be used without permission.